The New York Yankees star was discharged a few months after two Washington pols lobbied on his behalf with Army brass, documents show. In one conversation for which a transcript was prepared, Senator Albert “Happy” Chandler asked a general to review DiMaggio’s case and see if the athlete was medically fit to remain in the armed forces. 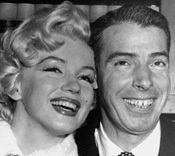 The Army documents also note that DiMaggio disclosed that he had a bout of gonorrhea in 1938, with “no recurrence.” This revelation, of course, will now require the issuance of revised editions of 742 Marilyn Monroe biographies. Submitted by acarsaid on Thu, 2010-08-05 17:23.